THIS ARTICLE FIRST APPEARED ON LET’S DISH. If you’ve never tried grilling corn, you’re definitely missing out! It’s my absolute favorite way to enjoy fresh corn. Not only is the corn itself amazing, there are all kinds of easy and delicious ways to dress up cob of corn, like this Grill Corn with Basil Butter. There are lots of methods out there for grilling corn, but my favorite also happens to be the easiest. At least, I think it’s the easiest. I just shuck the corn, rub it with some coconut oil, season it up with salt and pepper, and put it right on the grill. I usually grill my corn for about ten minutes over medium-high heat, turning every 2-3 minutes. There are instructions out there for grilling the corn in foil, or in it’s own husk, so feel free to use whatever method you prefer. The thing that makes the corn stand out in this recipe isn’t the corn at all–it’s the amazing, savory basil butter. Which is nothing more than fresh chopped basil mixed with some softened butter and a bit of salt, pepper, and minced garlic. It’s super simple, but boy is it ever fantastic! Don’t worry if you have extra basil butter, it’s great on almost any vegetable, as well as warm rolls and biscuits. 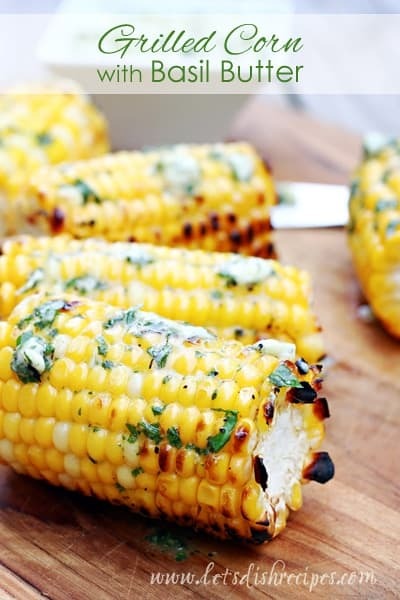 One thing is certain, however you decide to grill your corn, this will be a hit at all of your summer gatherings. In fact, you might never go back to eating regular corn again! Place the ingredients for the basil butter in the bowl of a food processor and pulse until blended. Transfer to a small bowl and set aside. Brush the corn with vegetable oil and season with salt and pepper. Grill for about 10-15 minutes, turning frequently, until corn is charred and tender. Serve hot with basil butter.